What does Repeal and Replace mean looking forward to 2017 and a Republican-controlled Executive Branch, House and Senate? What might change for group health plans/employers, for expatriates and for government subsidies? 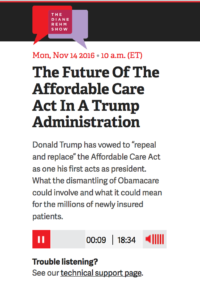 Listen to the discussion at http://thedianerehmshow.org/shows/2016-11-14/the-future-of-the-affordable-care-act-in-a-trump-administration. While 60 votes are required to veto and completely repeal Obamacare, as the speakers on today’s show clearly stated, most likely a Republican House and Senate will use “Budget Reconciliation” to repeal large portions of the bill, including federal subsidies. Of course, these are just the first days of President-Elect Trump’s selection of his cabinet and he has yet to fully map out his plan for his first 100 days (http://www.pbs.org/newshour/rundown/president-elect-donald-trumps-plan-first-100-days/#document/p1), and Vice President-Elect Mike Pence is just now forming his transition team. The President-Elect has indicated recently his desire to change sections of Obamacare versus repealing the entire bill. Time will tell. Obamacare originally passed as a two-part solution in order to use “Budget Reconciliation” to get a 51-vote majority, since they didn’t have 60 votes to approve it all at once. 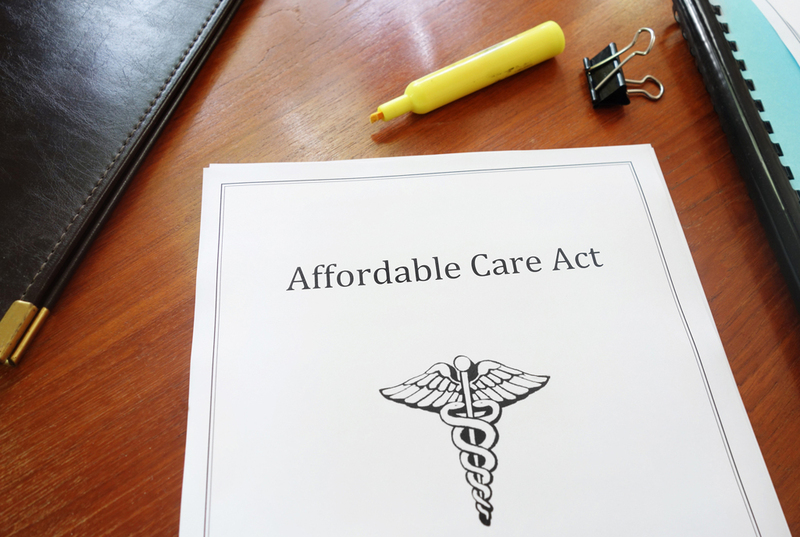 The second “reconciliation bill,” was passed after March 23, 2010 to make a series of discrete budgetary changes in the ACA (Public Law 111-148). That act, “The Health Care and Education Reconciliation Act of 2010,” was signed by the President on March 30, 2010, and became Public Law 111-152. Will Republicans use budget reconciliation to repeal Obamacare? This same path (budget reconciliation) is assuredly what Republicans (who won’t have 60 votes) will use in order to repeal portions of the ACA Healthcare bill. Republicans used this multiple times under Obam’s administration. They demonstrated after five years of effort that they could rescind Obamacare with a Republican president. “Reconciliation” legislation may only consider provisions that are primarily budgetary in nature (i.e. cost the government money such as subsidies). Policy changes with only incidental fiscal impact get stripped from the bill. (In addition, reconciliation legislation must not increase our budget deficit.) “Budget Reconciliation” is a procedure that allows legislation to be created or repealed with just 51 votes in the Senate, instead of a filibuster-proof 60 votes. Originally having passed two different ACA bills, the House and Senate needed to find a solution that would pass in both chambers. The politics were extremely complicated at the time because Nevada Senator and Senate Majority Leader, Harry Reid, could not afford to lose a single vote, and House Speaker Pelosi could afford to lose only two votes. 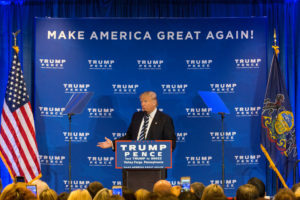 Some of the key provisions of the ACA Healthcare law – including the individual mandate to purchase health insurance, the creation of insurance exchanges where low-income families can buy subsidized policies, and Medicare and Medicaid-funding measures, probably meet reconciliation requirements. the ACA-mandate does not apply to those residing overseas (expatriates) and currently no short-term international travel insurance is “ACA-Compliant,” nor do they need to be. “Repeal and Replace Obamacare” became the mantra of a large field of Republican presidential candidates throughout the 2016 GOP primary. Dr. Ben Carson is supposedly helping Donald Trump craft portions of any new bill in order that hundreds of thousands of Americans will not lose their healthcare. Possible “high-risk pools” may be employed to protect insurance companies from major losses. It is still unclear how those with pre-existing conditions will secure insurance. for statements as they become available (before Jan. 1, 2017). What about prescription drugs? Are there going to be changes? – The subject is addressed at the 31:45 minutes mark in the discussion. Will there be bi-partisan support to help solve this increasingly important issue? Will anything change for group health insurance clients? Or group benefits? – See the 44:00 minute mark for some answers to this question. Good Neighbor Insurance also recently hosted an insurance panel on ACA Healthcare especially as it addresses group health insurance and international businesses and expatriates. You can get a copy of the transcript by simply emailing group@gninsurance.com and requesting it.